Here is my attempt to help delineate the difference between Ethan and Bennett and the new twins. Ethan and Bennett are fraternal twins. The new twins are identical. It is odd that we are having a set of each. It would more sense if the second set was also fraternal. Identical is not hereditary and is completely spontaneous. There is no evidence or reason of why identical twins happens. It just does. Like I said, I didn't decide this...he decided for me. And we couldn't be more THRILLED! Here is my attempt to explain the difference. 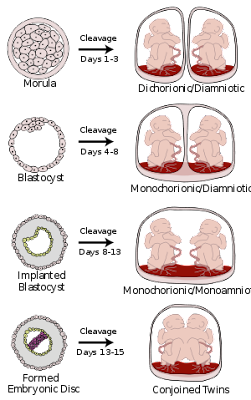 Identical occurs when a single egg is fertilized to form one zygote which then divides into two separate embryos. This type of twins is called Monozygotic. Fraternal occurs when two fertilized eggs are implanted in the uterine wall at the same time. This type of twins is called Dyzygotic. However, there are a few different types of identical twins. Our twins happen to be Monochorionic. This type of twin tends to have two amniotic sacs (called monochorionic-diamniotic 'MoDi') which is the most common type of identical twins. The benefits of this type of identical twins is that since they do have a small membrane that separates them then there i less change of them getting tangled. Here is the best picture that I could find to show it, but of course you will see the other kinds of twins as well.